Corky & Lenny’s has earned itself quite a reputation in the deli business, having served Clevelanders for over 55 years. The menu is massive and features all kinds of kosher and non-kosher goodies, including massive, overstuffed pastrami and corned beef sandwiches, various entrees featuring lox (smoked salmon), kishkas and knishes, burgers, and other treasures. I always make sure to bring my father a knish when I go to Corky & Lenny’s. You stand in line by the deli counter and are seated by the hostess. A small counter is also available for solo diners. 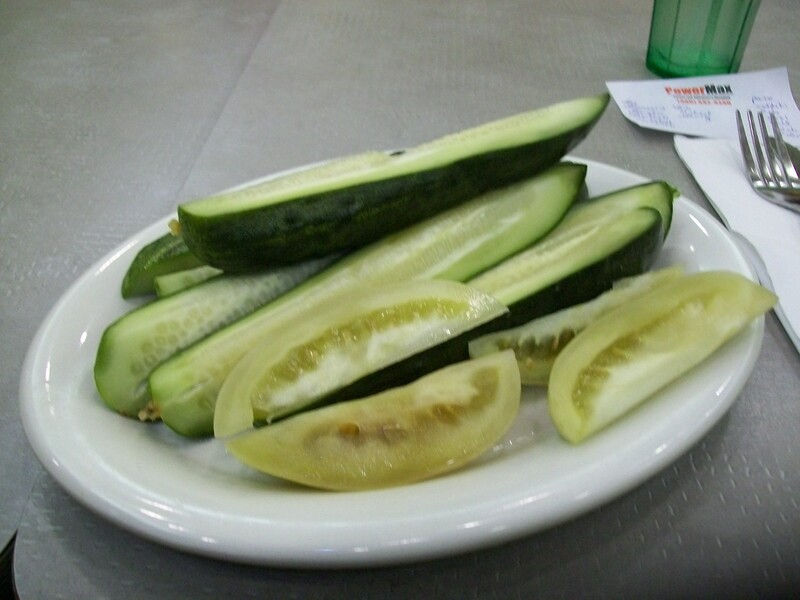 Once you are seated your waitress will come over with fresh pickles. Oh, the pickles! Dill, garlic, and other kosher deli pickles. To be honest, sometimes I just come for the pickles. They are the perfect compliment to a sandwich – and do a great job of taking the edge off your hunger while you are waiting. One of my favorite things at Corky & Lenny’s is the Mish Mash soup – chicken soup packed with a matzoh ball, kreplach, noodles and rice. Perfect if you can’t decide which doughy goodness you want, because you get them all. It’s only available in the large bowl size. I have been known to get it to go to eat over several days. It’s the perfect antidote for a wintery day or when you are sick. The broth isn’t as rich as Jack’s Deli’s and the matzoh ball is not very dense, but it hits the spot when you’re in the mood. Corky & Lenny’s is of course known for its sandwiches, which are ENORMOUS. I usually only eat half and then take the rest home. An hour or so later I then realize I’m kidding myself and scarf the rest down. They are known for their overstuffed corned beef, pastrami, roast beef and turkey breast – and tongue, which I can’t bring myself to try. The deli sandwiches are available in the regular size and the king size. You can also order a half a sandwich and soup (pictured to the right – I asked them to make a tuna and Swiss sandwich, which isn’t listed as a sandwich choice but they happily made for me). Some of my favorite sandwiches on the menu include the Clevelander or The East Sider, which features sliced turkey breast or roast beef, respectively, topped with cole slaw and Thousand Island Dressing on rye bread. 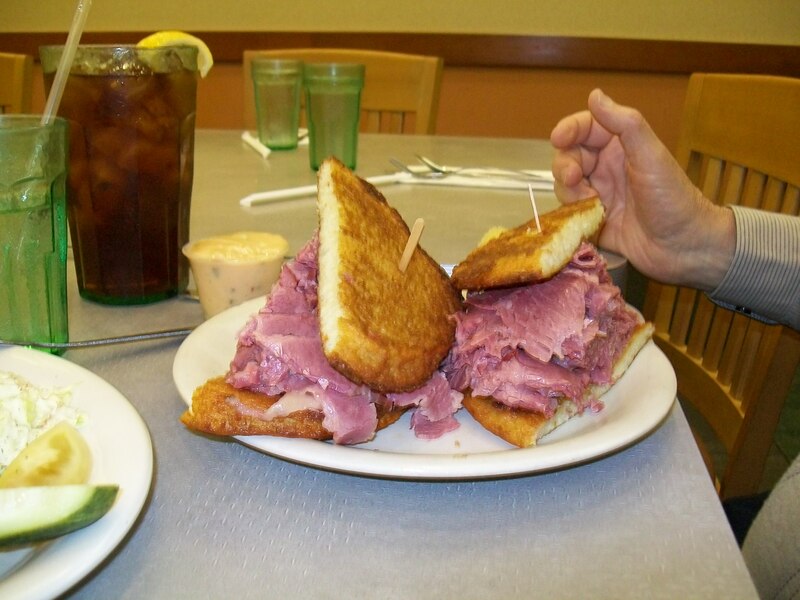 If you prefer hot sandwiches, you can’t go wrong with one of their Reubens (turkey or corned beef) or the Beef & Latkas (pictured here above), which feature corned beef on potato pancakes (latkas). One of my all-time favorites, which is frequently overlooked in such a packed menu, is the Challah Grill (pictured to the right), which comes with your choice of turkey breast, beef brisket or chicken with Muenster cheese grilled on challah bread with honey mustard sauce. Yum! I also sometimes get a craving for a hot turkey or roast beef sandwich and mashed potatoes in the winter. They have a decent hot turkey sandwich here – the bread is nice and soft and the gravy is flavorful. Although I have to say Jack’s mashed potatoes are better – with lumps. They have a really large menu featuring breakfast, lunch and dinner, so there is something for everyone’s taste. I love that they serve Arizona Mandarin Green Tea, so that is always a draw for me. They are also known for their chocolate phosphate. Whatever you decide to order, you won’t be disappointed. Once you are finished simply bring your bill to the register at the front of the deli and try not to take home a bag of bagels, some bread, or something from the deli or bakery counters. I dare you, because it simply isn’t possible.